The other night I couldn’t sleep so I did some online shopping. About 3:30 in the morning, I spotted the “huge guinea pig cage” that would eventually become Princess Piggy Poo’s new castle. Everything I’ve read says that pet store guinea pig cages are too small to keep a happy cavy. And I absolutely want my guinea pig giddy. The delivery came yesterday to my delight. So now Princess Piggy Poo has three houses: her tiny cottage, her main house and now the castle. From what I’ve witnessed so far, the only space Princess Piggy Poo really needs to be content is the confine of her hiding house. Since that is the area she occupies no matter which house she inhabits. That’s okay though, I’ve done my duty. Princess Piggy Poo does venture out to stroll over to the hay, toss the toilet paper roll and enjoy her veggies when the mood strikes her. But if she prefers the comfort of her throne, at least now it’s her choice. 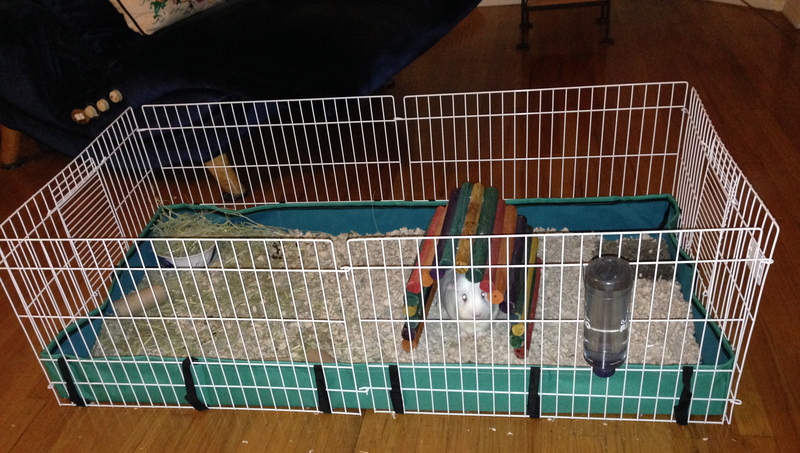 This entry was posted in Guinea pig housing and tagged cavy, guinea pig, hiding house, princess piggy poo. Bookmark the permalink. Wow! That’s bigger than some studio apartments in Manhattan! I hope the Princess will be very happy in her new castle. She is one lucky piggy poo.